Sometimes, there are things that exist but we don’t know about them. Himalayan Salt Deodorant falls into a similar category of Himalayan salt products. These salt deodorants can amaze you with their name and advantages. The Himalayan Salt Deodorant is also known as a Cleansing Crystal Salt Bar. This is one of the wonderful additions to the products of Himalayan salt mines in Pakistan. 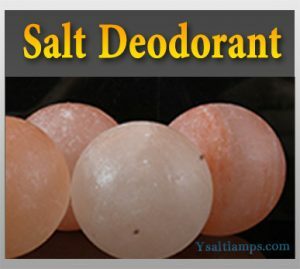 Unlike Salt lamps, deodorant is not something you would buy for decoration purposes, instead of that it is solely used for body hygiene and cleansing. Another thing that might come into your mind is alum stone as it is used to achieve similar results; however, Himalayan salt deodorant is a healthier alternative. Why? Because alum stone is chemically processed whereas, the Himalayan Salt Deodorants are completely natural and safe products. Also, the more important factor is that we carve the salt deodorants from the natural salt resources of Himalayan Mountains. It is not something new in few parts of the world. It has been in the use for centuries. Salt Deodorants don’t have any traces of alcohol, aluminum, perfume or any other chemical and for the same reason, you can use them all over the body. These beautifully carved chunks are not greasy and they don’t stick. They won’t even leave a stain on your clothes. When applied wet on a clean skin, the Himalayan Salt Deodorant forms an invisible protective layer on the skin and reduces the chances of the production of bacteria that cause repugnant smells and odors. Regular use of Himalayan Salt Deodorant will make you feel clean, fresh and charming. One of the benefits is that it doesn’t clog up your skin pores while remaining effective. The best product to get rid of horrible feet, smell, and odor. How would you use a Himalayan Salt Deodorant? Thoroughly wash and dry the body part where you want to apply the deodorant. Now, wet the deodorant and gently apply it on your skin thoroughly covering every part. Simply glide or massage your skin with the deodorant and don’t rub feverishly. Don’t use it like the normal soap bar. And, at the end, dry the deodorant with some cloth and put it in a safe place. Deodorant can turn into pieces if dropped on a hard surface, so take care that you don’t drop it and use it as gently as you can. Certainly, every day and around the world, we’re discovering new ways to make people feel better. We are creating more ideas for more people through our power of passion & creativity. We design and shape our groundbreaking Himalayan salt products to help people stay strong and healthy in all stages of life. Here is a separate page for Himalayan salt products! Obviously, it’s your passion for what you do that will give you the drive! And, it’s passion that gives you the energy to create any level of success. Also, it’s passion that fulfills your desire. In addition to that, you will have an extraordinary time while you doing the task. That’s the reason we are running our business with the most out of our passion for salt lamps! In short, our passionate attitude & creative mindset, plus manufacturer & exporter, make us happily do the wholesale salt lamps business. Also, through the export and wholesale business, we are reaching dozens of countries, hundreds of importers, and ultimately millions of consumers worldwide. So, what next? The next thing to see is whether you have an inquiry or order. Or, just a piece of information for us you may contact us. We would be happy to see even your two letters “Hi”.